The "Turning Pointe 55" Pirouette Shoes by Sophia Lucia are a much better fit for my daughter's feet. She has long, slender feet and these shoes conform to her feet better than the traditional leather or canvas pirouette shoes. There are no gaps or bulkiness on the sides of her feet. These shoes help show off her lines a lot better and they do not cut off her foot on top. She can turn so much better in these as well. They're easy to break in too with the soft leather. I would definitely recommend these shoes for everyday dancewear and the competition season. Bought 4 pairs as my daughter needs 2-3 at all times. I bought the 2 med based on her shoe size 7-7.5 and they were too small. The 2 large fit her but she if she grows anymore, she won't be able to use them long. Now I have 2 pairs sitting since I forgot to return them being the start of the season and 30 days runs real fast these days. Too bad if I used the local company for sizing they charge just to try on. I was hoping that she'd be able to have the large to grow into, but that didn't happen. If I knew it was this way, I would've just bought them locally. This half sole is perfect if you our your daughter is a turner. My girls are especially my youngest. 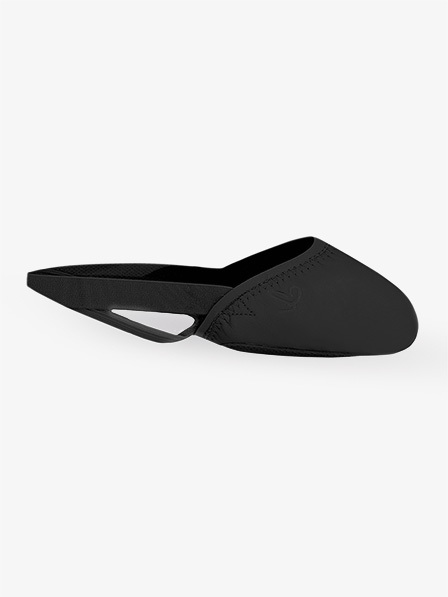 The sole is made similar to the Bloch Neoflex that my girls dance in on a regular basis. Both of my girls love the fit and comfort. I was worried about size since most reviews say they run small. My oldest wears a 9 in ladies and the XL fits perfect for her. My youngest wears a 7 in ladies and the L works great for her. I hope this review helps! I don't like the plastic foot pad on the bottom and runs small. Very nice shoes, but they run very small. My daughter wears a 7.5-8 street shoe so I ordered a medium and she could not straighten out her toes. Returning for a large. I purchased a Medium pair online for my daughter who wears a 6.5 street shoe (Size 7 Bloch super jazz) from another company. The shipment was extremely delayed, and she needed them for a performance, so I took her (and my little daughter) to a storefront to buy them. I'm so glad I did. They run extremely small. She needed a Large. My younger daughter who wears a street size 8.5 Toddler was able to fit into the child Mediums with just a tiny bit of growing room. They are very well made and have shown little signs of wear in the few months they have had them. The elastics are still in great shape and the leather is heavy and durable. All in all a great shoe, just very misleading sizing. Going by the sizing guidelines, I should've ordered a small. I'm typically a 6 1/2 in all dance shoes, but usually veer towards a 7 to be safe. The medium suggests size 8-9 which my feet would never come close to, so I thought the small would be the best choice. After receiving them, the back band is so tight that I'd be afraid it'd snap if I danced in them even once. These will go back. Sadly so, too. They seem to be made very well, just very small. I can't speak on the quality of these shoes yet as my daughter has not worn them yet. She wears size 8-8.5 shoe so we ordered the M per the sizing chart. They were way to small (she could barely get them on). They went to a dance friend who needed this style. She wears 7-7.5 shoe size and they fit her snugly (the girls thought they would stretch a little). I am re-ordering the L for my daughter. Do the straps on these lyrical shoes have the silicone grips to prevent slipping off the back heel? Yes. These shoes do have the gripping on the elastic to prevent sliding. whats the difference from the other ones that discount dances has, are these better?